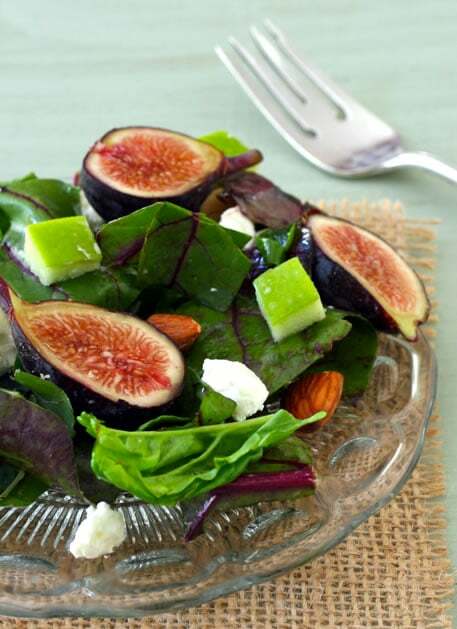 Fresh figs are flooding the local markets and I love combining them in an autumnal salad with almonds, apple and a drizzle of honey-infused vinaigrette. Ripe Meyer lemons on our trees are few and far between this month, but I found one remaining among the green golf ball-sized crop that will ripen early next winter. I use lemons almost every day in my low-salt kitchen and have been making my own vinaigrette for years, trying to vary my ingredients, keeping salads seasonal yet low in sodium. For my greens, I used a mixture of beet greens, baby spinach and kale. Originally, I made this salad using slices of goat cheese that I dipped and egg white and gently cooked in a bit of olive oil. Wanting to cut back on fat, calories, and cholesterol, I decided to simply add goat cheese crumbles instead. Toast the chopped almonds in a small skillet over medium heat. As soon as you smell the almonds, give the skillet a shake and toast for one more minute. Remove from heat and set aside. Whisk the olive oil, vinegar, honey, mustard, and lemon zest together in a large salad bowl. Add the greens, figs, apple, goat cheese crumbles, and toasted almonds. Toss gently with the vinaigrette. Serve at once. What a perfect, lovely salad that celebrates fall! Thank you, Susan – you always inspire me with your creative recipes. I wish we had fresh figs out here but on the East Coast I believe it is rare. I heard they are delectible. Believe me, having grown up in PA, I appreciate the bounty of fruit and vegetables that San Diego offers – and I have lived here since 1974. I wish I had this recipe 2 weeks ago when my figs were ripe! I’m in Ohio and I have 4 fig trees, 2 being producers right now….I love anything with fresh figs! Thanks for sharing this! Ditto, Julie, I love fresh figs. My elderly neighbors used to have three trees – how I miss them and the fig trees the new owners replaced with, well, nothing edible. I never do a perfect job on “unprocessed”, Wendy, but we have definitely incorporated it into a lifestyle. Larry is down 15 pounds, just following the “diet” for three years – and we eat well. 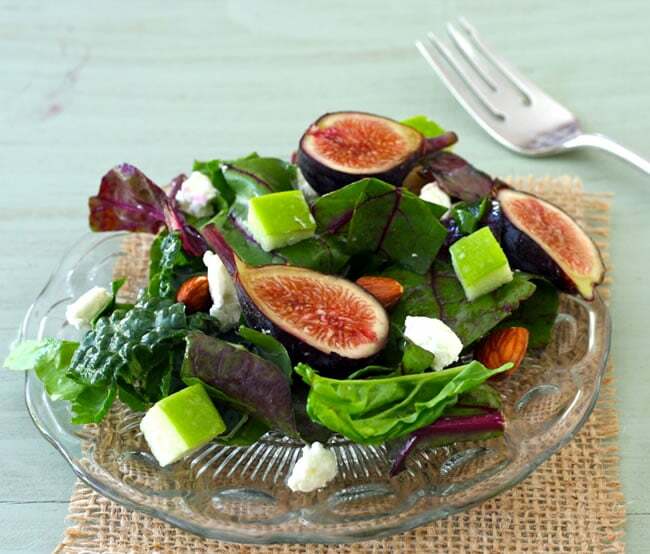 What a lovely salad – really intrigued by the combination of greens and what could possibly not be fabulous w meyer lemons, figs, apples, and goat cheese. I think blue could be fantastic as well! Great job Liz!